Chiropractic is a healthcare profession that has been around for more than 100 years, and focuses on improving overall health, rather than treating symptoms. Acupuncture is a holistic healthcare system which helps to restore harmony and balance in the body, mind and spirit. Here at The Retford Chiropractic Wellness Centre we believe that everyone should have the opportunity to reach their full health potential, and we are committed to helping you and your family achieve yours. We offer a wide range of therapies, such as acupuncture, massage and beauty, Yoga, meditation and Tai Chi classes, and we are more than happy to offer our sound, expert advice on health related issues to complement our outstanding Chiropractic care. 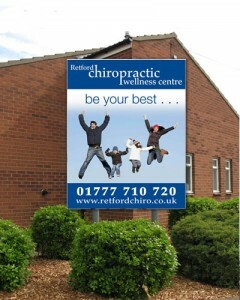 At the Retford Chiropractic Centre your wellness is our priority and we strive to help you be the best version of yourself. Choosing the correct course of treatment can be difficult. To enable you to make an informed choice about the right therapy for you we offer the opportunity of a courtesy consultation with one of our highly trained and experienced chiropractors to learn more about our treatments and how they can benefit you. Chiropractic is a hands on treatment suitable for the whole family. to chiropractic for help and here my interest began. James graduated from the Anglo-European College of Chiropractic, Bournemouth in 2008 where he was awarded the Flavio Grillo Award for Best Clinical Performance. Initially he hoped to become a GP but my direction of study changed after he saw how much Chiropractic benefited a friend who had chronic low back pain and disabling headaches following a car collision. The results she experienced were incredible. After graduating in Physiology and Biochemistry at Sheffield University I worked at Northern General Hospital in Sheffield in the cardiology department.. In 2012 I started my training to become a holistic therapist after being inspired by having worked as a chiropractic assistant at the clinic since 2005. The knowledge and understanding I gained from working closely with the chiropractors has been indispensable in my journey to becoming a qualified therapist. Clare joined Retford Chiropractic Wellness Centre in October 2016 following time away, working for some of the biggest names within the industry. The core principle of Chiropractic is holistic care. Nerve impulses flow from the brain and down the spinal cord. Pairs of nerve roots branch off from between each pair of spinal segments. These nerves link the brain with every organ, tissue and cell of your body.